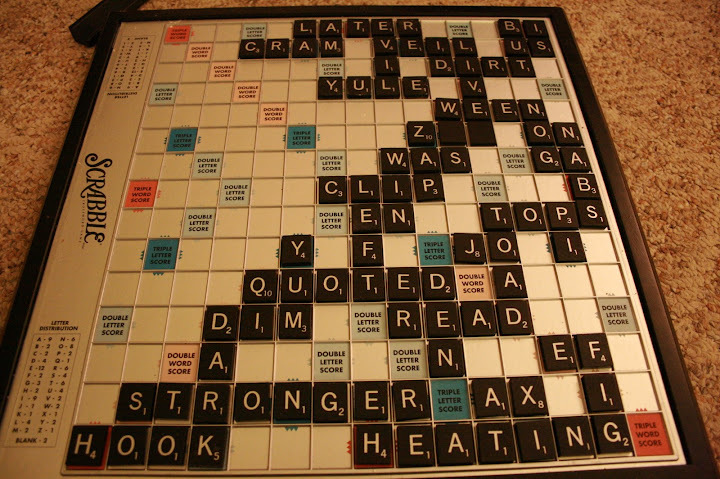 A two-person game of Scrabble feels and plays completely different than a four-person game. It's like you have to train yourself to play both types. And tonight I played my first non-Wordbiz bingo. Maybe everyone gets to this point, but once you play your first bingo, you start noticing them more often. The highest scoring 7-letter bingo in Scrabble is MUZJIKS. The highest scoring 8-letter bingo in Scrabble is QUIZZIFY (with a blank Z). Without the blank: BEZIQUES and CAZIQUES. But tonight I played STRONGER. The other night I built BALLOONINGS from LOON. When you play 8-10 games a day, you start seeing potential Scrabble boards in your head. Even at lunch, even when you take a bite of a baked potato, you won't stop those Scrabble tiles from popping up in your mind. P-O-T-A-T-O (that's almost a bingo...s....). You even start talking about similar Scrabble stories like the family games. Over Christmas break I read my first bit of Joan Didion, Slouching Towards Bethlehem. Her ability to keep me actively reading her boring stories just through her descriptive prowess made the read worth it. But, I was only super-impressed with one of her essays. I read a decent Poynter piece on narrative journalism during my visit to Katie and Tony in Waynesboro, Virginia. I read it again tonight while I worked some more on the massive bag of puppy chow they gave me during my visit. Erin ate some too. Also, check out the spray-on-condom. What kind of Scrabble board is this? I really like it. We have a newer deluxe board but Jon doesn't like to play. Thus, I've gotten really into crosswords, which I always like to believe are the fruits of really great Scrabble games. I've also found http://www.webcrosswords.com/. Pretty neat, though kind of crummy that it tells you if you're wrong. Where's the challenge, the mystery? For your independant study reading list, I'd strongly, strongly recommend you add some Tom Wolfe. One of the early collections ... I love Hunter as much as the next guy, b ut if you really want to see what print journalism can do, how fast it can go and still stay journalism, you have to read Wolfe. Naomi - It's the Onyx Edition. As good as the deluxe, but definitely did not match my expectations as far as aesthetic. Scrabble is Scrabble, though. You should download and play with us on Wordbiz. Elizabeth - I'm going to be adding authors as I go along. But yeah, I'll definitely be reading a hefty bit of Wolfe. Maria and Anna Downes and I have started a new club, "Scrabble 'n Pals." We invite a new prof every week. Tsao will be our first sometime next week, once he practices more online.